AP DEECET 2020 notification, ap dietcet application form 2020 : The Directorate of School Education Andhra pradesh is going to host the Andhra Pradesh Diploma in Elementary Education Common Entrance Test on — May 2020 to — May 2020 in two sessions on each day. Interested and eligible candidates can check out the ap deecet eligibility details by downloading the official AP DEECET Notification 2020 for the academic year 2020-2021. 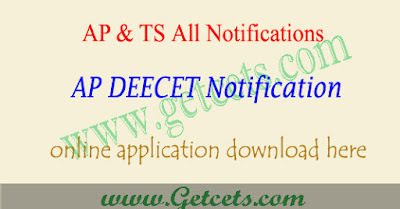 Candidates can check AP DEECET notification, ap dietcet online application form 2020, ap deecet apply online last date 2020, ap dietcet notification 2020 through this article. Candidates who took admission into two year diploma in elementary education (D.Ed) in Andhra Pradesh Government District institutions of educational training (AP DIETs) and private elementary teacher training institutions in the state applied and appeared for AP DEECET 2020 Exam. The AP DEECET 2020 Notification is for the candidates who are looking for the admissions in the diploma in elementary education (D.Ed) courses for the academic year 2020-21. To apply for this AP DEECET Application Form, candidates need to pay Rs. 500/- for General/OBC and Rs.400/- rest of the candidates. Candidates can check AP DEECET notification 2020, ap dietcet online application form 2020, ap deecet apply online last date 2020, ap dietcet notification 2020 through this article.